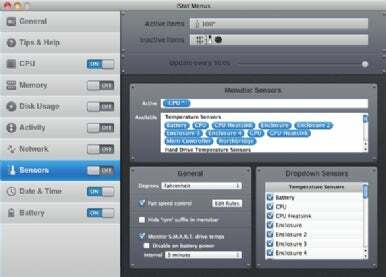 Bjango has updated iStat Menus, its system monitoring utility that lives in the menu bar, with some nips and tucks that should make it a better citizen on both PowerPC and Intel Macs. New in iStat Menus 3.1 is an optional “Combined extra” that slims down the amount of space iStat Menus’s widgets take up. Instead of separate icons for each monitoring component you enable, the Combined extra can scrunch all icons into a single item and place their options under one single drop-down menu. Bjango also added around 100 new sensors for Intel-based Macs, allowing owners of newer machines to accurately monitor things like internal heat and fan speeds. Users of PowerMac G5s and even PowerBook G4s may also appreciate this update, as Bjango improved sensor support for those machines as well. A handful of bugs were also squashed in this update, which is free to owners of iStat Menus 3.0. A free demo is available, and a license costs $16.